Dr. Amati along with his wife Blakely, their two sons, Martin and Henry, their daughter Beatrice and pound puppy Kennedy live in downtown Greenville. This location is right in the middle between Blakely’s job as a pediatrician with the Greenville Health System and Nick’s office in Taylors. Dr. Amati studied Mechanical Engineering at Virginia Tech before moving to Charleston where he worked as the Resident Engineer at The Citadel before attending dental school. He met Blakely while attending MUSC and they were married in 2010 and returned to Blakely’s hometown of Greenville. Their son, Martin, named after Dr. Amati’s late father, was born in March of 2011 and Henry was born New Year’s Eve 2013. Their daughter Beatrice arrived four years later in August 2017. 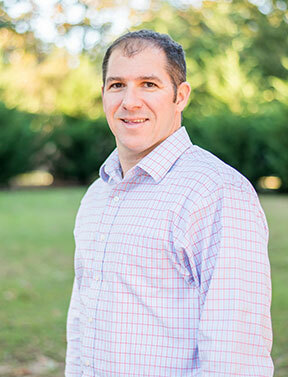 Nick enjoys mostly spending time with his family, boating on Lake Keowee, coaching his boys’ basketball and his hobbies of gardening, woodworking, and baking. He has also been very involved in volunteering his time through Family Dental Health's Free Dental Days.